The magic number is 1.223. I want to put a new TV in our bedroom. Right now we have a old 19" 4:3 aspect ratio television. It's really just your standard bedroom television. It has actually worked out pretty well for us, the size was decent for watching TV shows, but this has changed. What changed was that I started recording more and more High Definition TV shows. This creates two problems. First, what's the point of recording in HD if you are going to watch it on a standard definition television? Second, HD shows are broadcast in 16:9 and this means letterbox on a small television. So, I want to put an HDTV in our bedroom. Assuming that Heather lets me spend the money on a new TV (probably a bad assumption), the next question becomes - "How big of a TV should I buy?" As I said before, 19" was just fine for our bedroom. However, if I buy a 19" widescreen television, whenever we watch a 4:3 program on the TV it will actually be a smaller image than it is on our current TV. So, I want to make sure that if we buy a new TV, it displays an image at least as large as our current TV. This is where the "magic number" comes into play. I'm a geek, I'm sure you already know that. Well, I also enjoy an algebra problem from time to time. Finding out what diagonal measurement of a 16:9 television corresponds to the same vertical height in a 4:3 television was a "fun" problem to solve. It turns out that if you have a 4:3 television and you want to know how big a 16:9 television that displays a 4:3 image at the same size as the 4:3 television needs to be, you just have to multiply the diagonal of the 4:3 television by 1.223. For example, my 19" 4:3 television translates into a 23.237" 16:9 television. Since they don't make 23.237" TVs, I can round up and say that I need to get a TV that is at least 24" if I want to see a 4:3 image in at least the same size. So there you go. I did the math so you don't have to. If you're looking to replace your old 4:3 standard definition TV with a new HDTV, just make sure you get one that is at least 1.223 times larger. The magic number is 1.223. I want to put a new TV in our bedroom. Right now we have a old 19" 4:3 aspect ratio television. It's really just your standard bedroom television. It has actually worked out pretty well for us, the size was decent for watching TV shows, but this has changed. What changed was that I started recording more and more High Definition TV shows. This creates two problems. First, what's the point of recording in HD if you are going to watch it on a standard definition television? Second, HD shows are broadcast in 16:9 and this means letterbox on a small television. So, I want to put an HDTV in our bedroom. Assuming that Heather lets me spend the money on a new TV (probably a bad assumption), the next question becomes - "How big of a TV should I buy?" As I said before, 19" was just fine for our bedroom. 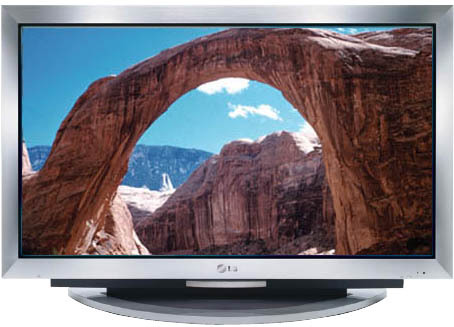 However, if I buy a 19" widescreen television, whenever we watch a 4:3 program on the TV it will actually be a smaller image than it is on our current TV. So, I want to make sure that if we buy a new TV, it displays an image at least as large as our current TV. This is where the "magic number" comes into play. I'm a geek, I'm sure you already know that. Well, I also enjoy an algebra problem from time to time. Finding out what diagonal measurement of a 16:9 television corresponds to the same vertical height in a 4:3 television was a "fun" problem to solve. It turns out that if you have a 4:3 television and you want to know how big a 16:9 television that displays a 4:3 image at the same size as the 4:3 television needs to be, you just have to multiply the diagonal of the 4:3 television by 1.223. For example, my 19" 4:3 television translates into a 23.237" 16:9 television. Since they don't make 23.237" TVs, I can round up and say that I need to get a TV that is at least 24" if I want to see a 4:3 image in at least the same size. So there you go. I did the math so you don't have to. If you're looking to replace your old 4:3 standard definition TV with a new HDTV, just make sure you get one that is at least 1.223 times larger.